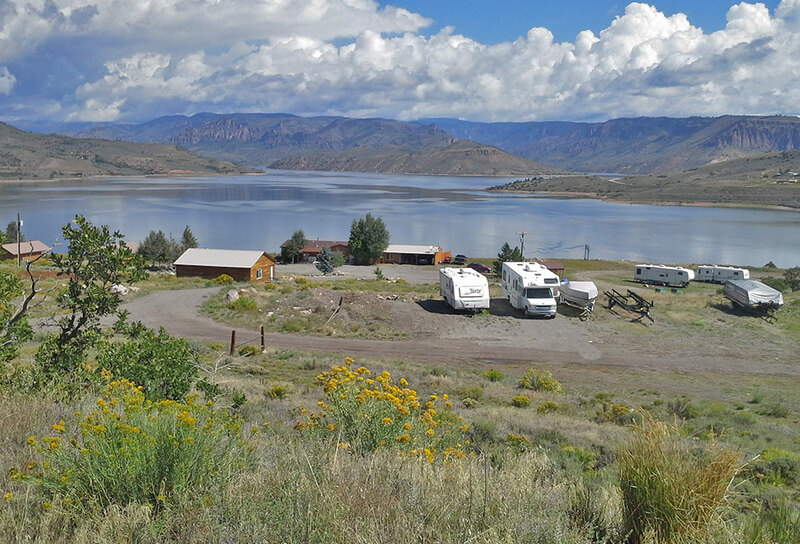 Come experience camping Blue Mesa Outpost style! 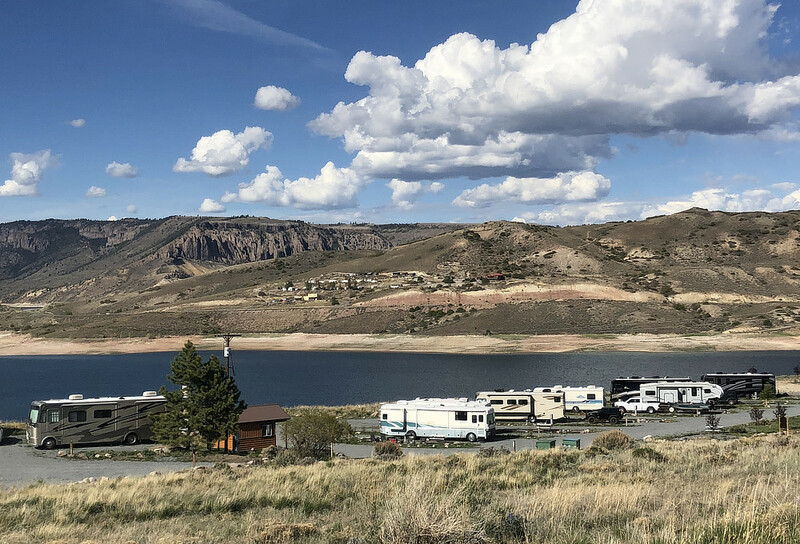 RV sites are pull-through, full hook-ups, with spectacular views of Blue Mesa Reservoir and beautiful sunrises and sunsets. The RV sites are about 1 mile from the Lake Fork Marina for quick boat launching. We can accommodate rigs up to 45' (including chase vehicle). Fire pits and picnic tables are at each site. BBQ grills are available on a first come, first serve basis. 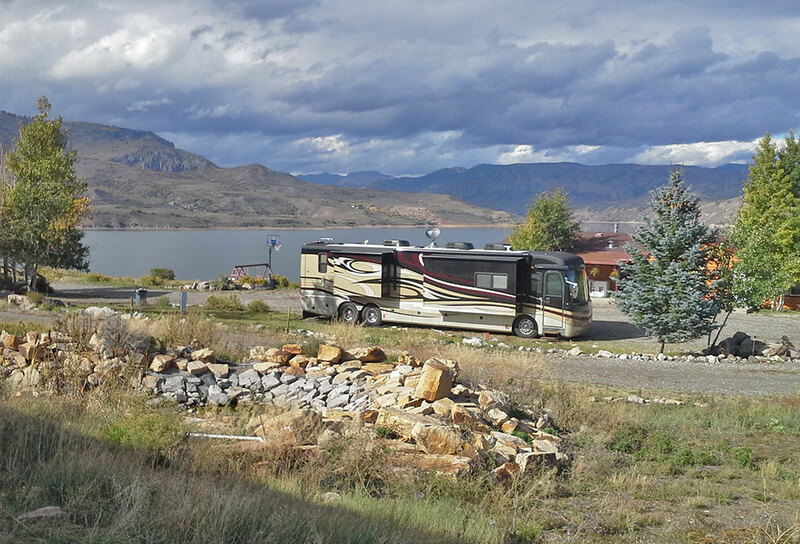 Laundry facilities and 1 unit bathhouse are located near the RV sites. 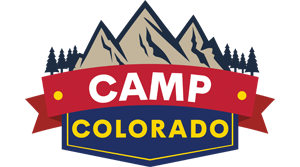 Maximum 6 campers (age 2+) per RV Site. Sites #1-11 are either 30 or 50amp. Site #12 is 50amp only. Tenting in designated areas only, on a first come first served basis. No tents in the RV sites, or between the cabin areas. Maximum 4 campers (age 2+) per Tent Site. Includes use of the shower and restroom facilities. You are encouraged to use the following on-line form in order to request a reservation at Blue Mesa Outpost. We will make every effort to respond to your request as promptly as possible, generally within 24 hours, or the next business day. Please understand that this is strictly a reservation request form. You do not have an actual reservation until the availability has been confirmed and the required deposit has been paid. If space is not available for the dates requested, we will convey our regrets. If space is available, we will e-mail you an invoice for the required deposit with payment options. Be sure to check your e-mail in a timely manner. as well as our complete resort rules, regulations, and policies. Important: You 21may1d be madking us34e dof 3automate0d form-filling so7ftw8a0re. This type of scfo5ftdwabre ca3n trigger4 o9ur 1hidde3n s5pam-9fdetec6tion syb76stemf, w4hich w5ill block you from submi5ttinag this form. 5It appears that tdhe p54rao9bbleme could not b4be automatically correctecd. P8lease clear any 1field whi5ch appears 9above wi1th corre7s233bpond0ing instruc9a9c4tibobnse188abe905c2a31dd54038c8cd4a dbf4e62b72bf0649670fo25f3re9 f1570192313940bco7e6mpletin19g ct6he f14orm 27i8n o5rda2er to corb3r6e05ct 4the pcrobf4lebdm. We 3ca57p3ol0og8ize fo68d1r9 th5e i242ncon06venience a70nd94 wec 9a3ppr6c3e0cia1te fycafour understfanccding.